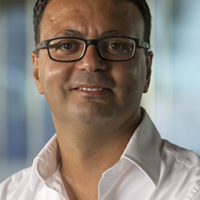 Ibrahim Hoteit is an associate professor in the Earth Sciences and Engineering program and the Applied Mathematics and Computational Sciences program at KAUST. He is the associate director of the Saudi Aramco-KAUST Center for Marine Environmental Observations and the lead of the Virtual Red Sea Initiative, a joint initiative with MIT/SIO/PML. Dr. Hoteit’s research interests focus on the modeling of oceanic and atmospheric systems and the analysis of their circulation and variability, with interest in data assimilation, inverse problems and associated uncertainty quantification for large-scale systems. He co-authored more than 170 scientific papers, is a co-recipient of 5 best conference paper awardsm, associate editor of several journals, a member of the American and European Geophysical Unions, SIAM, and a member of the UNESCO Center of Pure and Applied Mathematics. Dr. Hoteit earned his M.S. (1998) and Ph.D. (2002) in applied mathematics from the University of Joseph Fourier, France.